Adobe has launched an online version of Photoshop but has had to hurriedly rethink its terms and conditions of usage. The simplified online version of Photoshop is aimed at getting more people to use the product and ultimately to get more people buying the product. In the online version, the images you create are stored centrally, on Adobe servers. Currently it is only available in the US, and Adobe warns that download speeds are necessarily slow. From the initial product descriptions, it seems to do little more than the basic graphics packages that come free with most digital cameras and scanners. Within days of announcing the product, Adobe was getting bad publicity for its terms and conditions of usage after an outcry over the clause which seems to say you gave Adobe rights to do whatever they wanted with your photos, whenever they wanted: "You grant Adobe a worldwide, royalty-free, non-exclusive, perpetual, irrevocable, and fully sub-licensable license to use, distribute, derive revenue or other remuneration from, reproduce, modify, adapt, publish, translate, publicly perform and publicly display such Content (in whole or in part) and to incorporate such Content into other Materials or works in any format or medium now known or later developed." Following critical feedback, Adobe has said its legal team is in the process of rewriting the clause, but such clauses are not uncommon on websites. If you upload photos to a website, or upload stories you have written, videos you have made, songs you have sung, you may find you handed over all your rights to the server operator. You may think this is not too important if all you are uploading is a few snaps of yourself that you took on holiday. They were not professionally taken and who is going to want to use your photos? Consider the case last year of Alison Chang of Dallas, Texas, and Virgin Media Australia. Alison, now aged 16, had her photograph taken at a car wash by a friend from her church. In the photo she is holding her fingers up in a "V for Victory" gesture. The friend posted it to the Flickr website unaware that in doing so he was agreeing to a license condition which allowed anyone to re-use that image for any purpose. 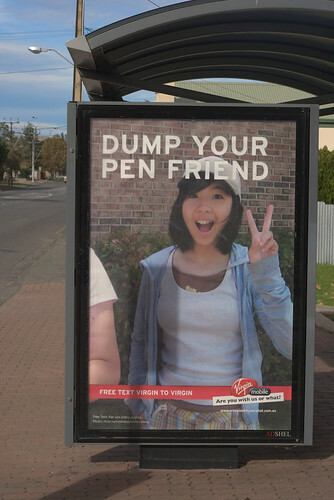 So it came as an unwelcome surprise to Alison Chang when she later discovered the photo of her was being used on billboards in Australia by Virgin with the caption "Dump you pen friend". In very small print in the bottom right of the poster it gives a link to the page on Flickr where the image was taken from, which is the condition Flickr imposes for use of the images. Virgin, a major company, has used this photograph without paying any fee to the photographer, without seeking the permission of the photographer, and without obtaining any model release from the person in the photo who was only 15 at the time, and is using the photo in conjunction with a caption which is less than flattering, and yet in the eyes of the law it has done nothing wrong. 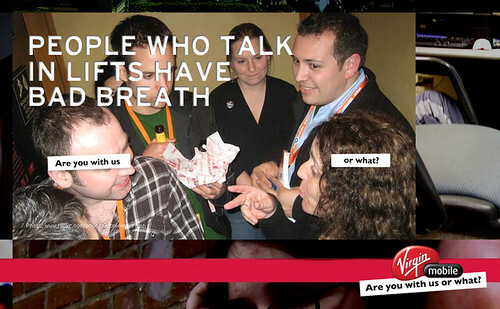 It was not the only photo from public sources that Virgin has used in its campaign which it describes, in marketing speak, as being "edgy", and many of the photos use disparaging or offensive comments. For example, one shows a man in a bus with the caption "Strangers are just serial killers you haven't met yet" and another shows a group of five people in a lift with the caption "People who talk in lifts have bad breath". I have read reports that the agency which created the campaign used over 100 photos altogether, which is obviously a huge saving for the company, but it does mean amateur photographers are now being used to subsidise big business, whilst professional photographers are finding it harder and harder to make a living.